Students from AU’s chapter of the American Marketing Association won the first LaunchU digital marketing competition hosted by Naperville-based Launch Digital Marketing. Front row, L-R: Paige Fisher, LDM’s Rachel Gelb, Kelly Hauge; back row, L-R: Bradley Kigyos, Cory Nordine. A team of students from Aurora University’s chapter of the American Marketing Association (AU/AMA) won first place in the inaugural LaunchU digital marketing competition. The contest, hosted by Naperville-based Launch Digital Marketing (LDM), pitted teams from 10 area schools against the clock and each other in a daylong battle to develop online promotional campaigns for local nonprofits. 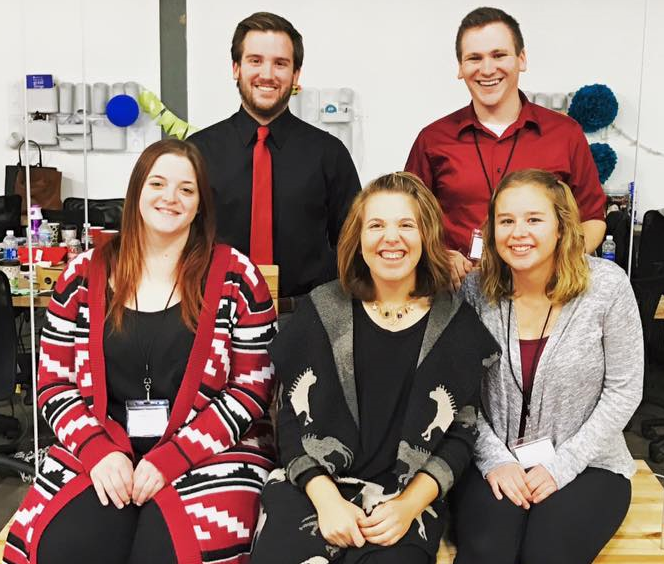 Members of the AU/AMA team include seniors Paige Fisher and Kelly Hauge of Oswego, Bradley Kigyos of Maple Park and Cory Nordine of Montgomery. Teams from the College of DuPage, Lewis University and North Central College also competed in the event, which took place in November. According to Ryan Shreve, an LDM web developer who helped organize the event, LaunchU is intended not only to support area nonprofits but also to give participants an immersive, hands-on learning experience. The AU/AMA team partnered with The H Foundation to design and code a landing page for the nonprofit’s Goombay Bash, a Caribbean-themed affair held at Chicago’s Navy Pier each summer to raise money for cancer research. According to Kelly Hauge, the team also developed an online advertising strategy and determined best practices to drive traffic to the landing page. The first-place finish provides The H Foundation with $10,000 worth of free Google ads (made available through the Google Grants Program) to promote the fundraiser. In related news, a second AU/AMA team has been selected as a finalist in the 6th Annual GfK Next Generation Market Research Competition. GfK, one of the world’s largest market research and consumer information companies, created the contest as a way to give undergraduate students in North America a chance to test their marketing and research skills and address pressing issues that face today’s marketers. AU/AMA teams won the prestigious competition last year and in 2013. This year’s winner will be announced in March 2017.